TTT: Fandom Freebie (Full of Sherlock Silliness). Top Ten Tuesday (TTT) brought to you by The Broke and the Bookish. April 4: Fandom Freebie — top ten fandoms I’m in, 10 reasons X fandom is the best, must have merchandise for x fandom, etc. etc. I should probably stop here and mention that NONE of the graphics this week are mine. They are all fabulous finds of mine on Pinterest. If you so desire, you can visit me over at my I am SHERlocked board for more. There are so many great fandoms out there. Books, TV, and movies are the ones I gravitate to. Harry Potter. Star Wars. Doctor Who. All things Disney. Gilmore Girls. Veronica Mars. Pretty Little Liars. You get the idea. But there is one fandom for me that sparkles just a little more than any other. Now, for those of you unfamiliar with BBC Sherlock, it is a wonderfully fantastic show staring Benedict Cumberbatch and Martin Freeman, filled with short seasons and extraordinarily long hiatuses in between. 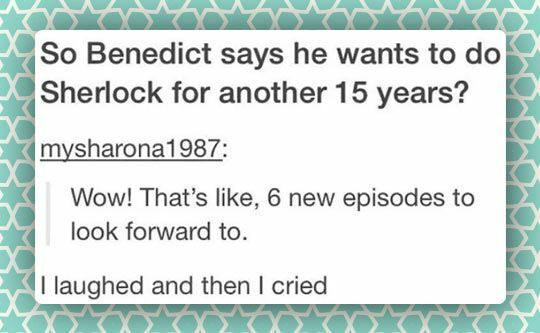 The show has been on the air since January 2010, and we Sherlockians now have a grand total of 13 episodes to watch. Oh, yes. You read that right. THIRTEEN episodes. Three per season (or series, as they say in the UK), four seasons (series), and a 2016 Christmas special. As I trolled through my Pinterest board, I knew there was no way I could keep this to just 10 silly gifs. Sorry. (Not sorry.) You get a lot of silliness this week. So much so that I lost count. 😉 (You know I can talk about Sherlock all day long, right?) BUT I did group them together for your viewing pleasure. Click on the pictures for a larger, easier-on-the-eyes version. Somehow the fandom started comparing pictures of Benedict to pictures of otters. Then Martin Freeman to hedgehogs. It was all downhill from there. These are ridiculous. And make me giggle. Sherlockians. We are a weird bunch. Just a couple of examples of the silliness that hiatus brings. These are super narrow pictures from Pinterest. I shrunk them to fit on the page, but they are hilarious. Open for a closer look. Welcome to the Sherlock Fandom. What Fandom did you highlight this week? I can’t wait to hear about it and what makes it so fantastic! Are you a Sherlockian too? (Or a Cumbercookie? Or both?) Sign off below and link up to your own TTT if you’ve got one! ← TTT: Imaginary Outings with Authors. I know, right? We’re doomed! Ha! I do love Sherlock! I haven’t finished the most recent season yet, but I will. LOL, it is a pretty fun fandom, most of the time. Since I fall in the camp that loves “The Canon” most of all, I sometimes feel excluded by those who don’t want to acknowledge ACD. Which is silly, because without him none of it would have existed. Anyway, they couldn’t have chosen a better pair for this iteration of Sherlock. Oh these are fantastic! I love Sherlock memes! I just (like really just) finished the last episode of the 4th series and my head is still spinning. There was a distinct final touch at the end. I’m trying not to imagine that it really is the end. I guess I do have all 13 to go back and rewatch! I’m sure there’s a detail or two or five that I missed the first time around. The more you watch them the better they get! 🙂 And if series 4 is the last, at least we’ll always have the silly memes! Fantastic post! I can’t believe I’ve never seen Sherlock but I really must! Love it! 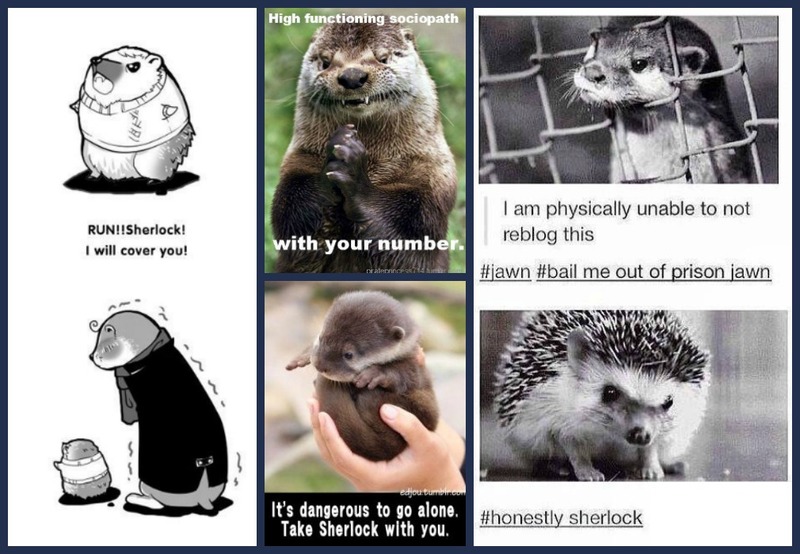 The otter/hedgehog ones always crack me up! I know, Otterlock is so cute!! I love them too. This is one of those shows that has lived on my must watch list forever. I need to dive in at some point!! It is such a great show! My favorite ones are the funny episodes. And with only 13, it’s easy to binge watch. Each episode is about 90 minutes. Otterlock. Lol. I love it. 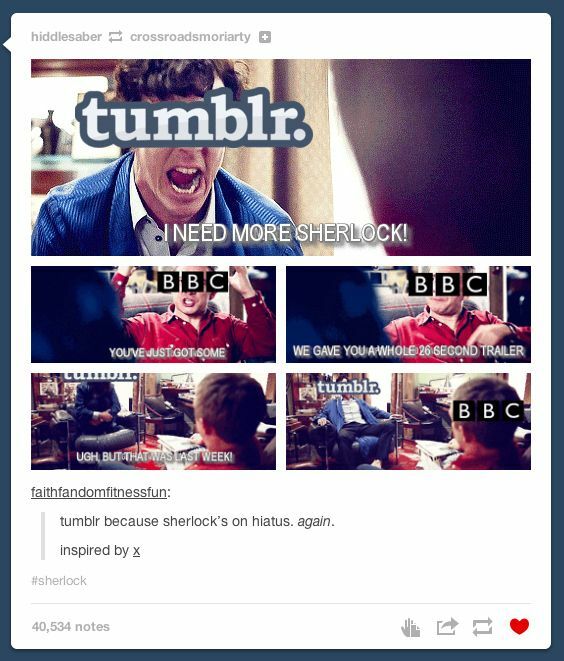 Who knew there were such interesting Sherlock things out there like that! I love Sherlock, too! Such a great show! Ha ha these are all so great! We need something to keep us sane during the long stretches with no episodes!